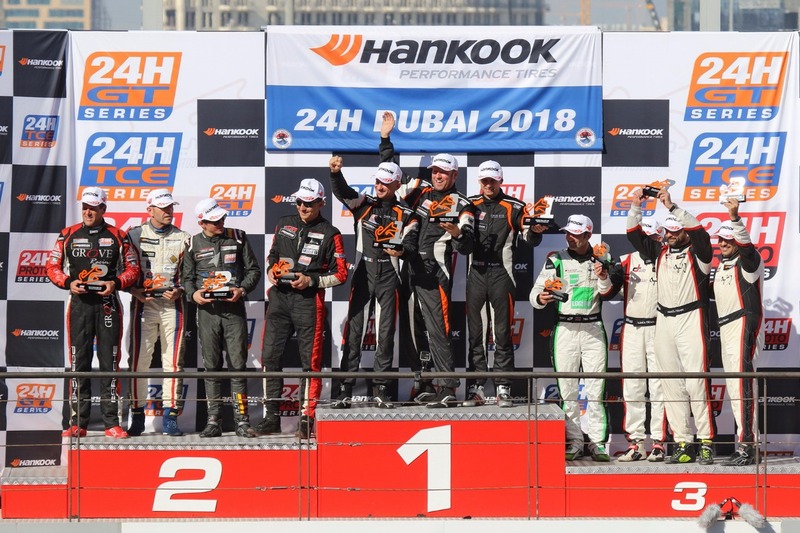 Phil Quaife and the race:pro motorsport team took a faultless 991-AM class victory in the opening round of the 2018 24H Series in the Dubai 24 Hours (11-13 January). Despite the race being his first outing with the German squad, Quaife put his previous experience at the Dubai event, and in the Porsche 911 Cup car to good use, adding to his 2015 class win. The Kent-based driver shared the wheel with James Thorpe, Sean McInerney and Claudio Cappelli. During the private testing and practice sessions, the quartet focussed on race setup, and getting all the drivers up too speed on the Dubai Autodrome track. After completing the mandatory laps in the dark practice session and finding a setup for the race, Quaife was selected to qualify the car, putting it a close second in class. “Qualifying was 45 minutes, so we fuelled the car for six laps, and allocated a single set of tyres. We ended up only doing a couple of laps, and held provisional pole early in the session, but FACH AUTO TECH pipped us by just five-hundredths, as they were able to take advantage of a new set of tyres when the track was at its quickest! Lining up second on the grid, Quaife started the race, taking the class lead before handing over to Thorpe after a single stint. The team continued to run strongly throughout the remainder of Friday, and were in a good position as the darkness fell over the 5.39 km track. Quaife split the bulk of the night shift with Cappelli, often running up to the two-hour maximum driver time, meaning they had to adapt their strategy. By the morning, they were in a solid second position, within striking distance of the leader, before taking first place when their strategy plans paid off. They were then able to conserve fuel to the chequered flag, bringing it home over a lap ahead of their nearest class competitor and an impressive 17th place overall, with Quaife setting the fastest lap. “It came as a nice surprise to see MRS pit, as we knew we could run to the flag at a more comfortable pace. Our fuel had looked a little bit touch-and-go before that happened, but we brought it home and all in all the race went smoothly, I’m delighted with the result! “We didn’t suffer any mechanical problems, nor contact, and only had routine pit-stops, which all went according to plan. I’m very happy to have also set the fastest average lap time in class. Quaife is exploring his options for 2018, with several programmes in the works, which will be announced over the coming months.